Experiencing neck pain looking down is just one spinal region that might be painful upon flexion. Middle and lower back pain is also commonly suffered by many patients, either in combination with neck pain or in the absence of actual neck pain. Neck flexion is one of the most commonly cited instigators of symptomatic activity in the upper dorsal region, but why does this occur? When discussing flexion, we are describing the movement wherein the patient looks downwards, moving their chin towards their chest. A few patients might suffer pain from any degree of flexion, while most will only suffer pain once a certain significant degree of flexion is attained. In essence, they simply look down “too far” and then get a sharp reminder of their recurrent torment. This discussion provides an overview of neck pain that is experienced when looking down. We will examine the potential causes of flexion-related neck and back pain, as well as provide some factual information that is not often covered during medical consultations. Muscular causes of neck pain upon flexion can be created by soft tissue injury, such as common neck strain, or by muscular imbalances in matched pairs of opposing motion or supportive muscles. Muscular causation for movement-related neck pain is certainly the most common origin, regardless of the specific range of motion that elicits symptoms. Muscular injury can be painful for days or weeks, depending on the location and extent of damage. Injury can affect the muscles themselves or any of their connecting ligaments or tendons. Severe trauma might even cause detachment of anatomical connections, creating significant pain and noticeable functional deficits. Meanwhile, muscular imbalances are more of a primary cause of middle or lower back pain when the neck is flexed. Very tight hip flexors can strain the muscles of the back downwards, creating exceptional length and internal tension in the tissues. Likewise, exceptionally short and tight frontal shoulder and chest muscles can draw the back muscles upwards, once again elongating and weakening them. Since the middle or lower back muscles are already so tight and forward flexion of the neck elongates them further, pain is likely to occur. Generally poor posture and forward head positioning can also create muscular issues, such as strain and imbalances that can account for these types of symptoms. Spinal causes can also be the origin of flexion-related neck or back pain. Remember that the spine is arranged as a column, wherein each level interacts with the ones above and below. This configuration provides great strength, but definitely disposes the person towards pain when one or more spinal sections suffers pathology of virtually any kind. Disc irregularities, such as cervical herniation and degeneration, are usually innocuous. However, some can create pain due to neurological compression and some of these syndromes only enact discomfort during particular ranges of movement, such as during neck flexion. Arthritic accumulation in the cervical spine can and does cause movement-related pain is some patients, even though most osteo forms of arthritis are not symptomatic. Bone spurs can interfere with normal joint movement or can interact painfully with other skeletal surfaces when the neck is mobilized in any direction. Since these spurs are can be located in many different areas, it is possible to suffer pain only upon flexion or during virtually any other movement activity, including turning the head, tilting the head to the side or neck extension. Changes to the cervical lordosis or thoracic kyphosis can both cause neck or upper back pain upon neck flexion. Likewise, rare cervical spinal scoliosis can also create painful neck movement in virtually any direction. 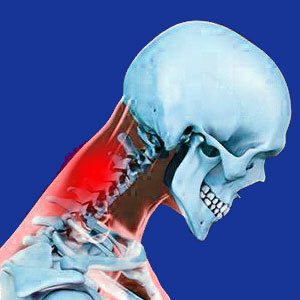 Cervical spondylolisthesis can benefit from neck flexion or may suffer increased symptomology from looking downwards. Typically, when retrolisthesis is present, flexion-related pain will not be present. However, when anterolisthesis is present, pain may be amplified when the patient moves their chin to their chest. Mindbody pain syndromes can assume any form or symptom set. We have seen those that are universally experienced by all, such as headache, stomach upset or back soreness, as well as highly specific cases that involve extremely narrow symptomatic instigators. We have certainly evaluated a fair share of flexion-related pain syndromes that were completely nonstructural in nature and have resolved with the use of appropriate mindbody therapy. The usual mechanism for these psychogenic pain conditions is regional ischemia. This oxygen deprivation can target the nerves in the spine or in the regional area of the neck. It can also target the muscles, ligaments and tendons of the greater neck anatomy. Therefore, it can mimic many other structurally-based pain syndromes perfectly, including those experienced with muscular strain, imbalances, herniated discs and various form of spinal stenosis. Since mindbody medicine is not a common practice focus, most victims will not receive a correct diagnosis and will be assigned treatment for a structural irregularity that might surely be present, but is not the true source of pain. This explains why so many neck pain syndromes become chronic, even when being treated with seemingly ideal therapeutic interventions. Try to improve your posture to relieve pain, as well as improve your general wellness. Stand and sit properly at all times. Try not to maintain a forward head posture or strain muscles from extended periods of flexion, such as when looking down to read or work on a computer or mobile device. If you suspect muscular issues at the heart of a lasting flexion-based neck pain problem, doing exercises and stretches that will help diminish muscular imbalances certainly will not hurt and might actually provide a complete cure in select instances. If you have acute pain, do not immobilize the neck with a brace or collar, but instead move it conservatively and gently to enhance the healing response and prevent further shortening and tightening of neck muscles due to atrophy and inactivity. For best diagnostic results, try consulting with multiple types of care providers and get their opinions on the most logical source of pain. You are likely to receive contrasting opinions, depending on what type of doctors you seek out for evaluation. We recommend seeing a physical therapist, sports medicine physician and a neurologist for best results. Time often resolves these types of conditions as the body naturally and organically removes tension that is responsible for pain. We often report that the very best cure for many types of dorsalgia is simply patience and the passage of time.